It may be that I'm the result of Depression-era parents or that I'm just plain cheap. I rely on elbow grease and baking soda to clean the bathroom; we use clothespins to keep our chip bags shut; plastic bags work great the second time around; you won't find that many pieces of clothing in my closet that cost more than $20; and my workout "club" doubles as the laundry room. This frugality spills over into all parts of my life, including my creative world. Not to say that I'm not sitting on a small fortune of beads, buttons, metal, yarn, and tools! But if there's a cheap way to get something done, I do it. I struggled for a long time to find a way to get good indoor lighting for photography without having to invest in special lights and a photo dome. Before, I'd wait for a nice day and shoot as much as I could outside. But that's not always feasible, especially in Minnesota, where it's cloudy half the year and raining a good portion of the rest. I played around with different scenarios quite a bit and found that the setup that gave me the most flexibility and least headache was pretty low-tech: two 60W task lights pointed at each other over a white paper "corner" I made with sheets of white card stock. This configuration reduces the amount of shadow coming off the pieces when I shoot them. It works well for me, too, in that I can instantly set it up on my messy worktable and break it down just as quickly–no storage. When shooting with this light box, I make sure to set the white balance menu in my camera to "tungsten" to compensate for the yellowy light. I also up the exposure to +1 so the piece doesn't go dark. 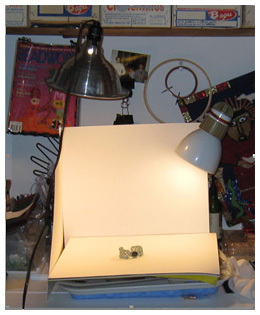 Do you have some quick dash/low cash in-house photo studio tips you’d like to share? Post them on the website!